This divorce forms packet is suitable for divorcing parties who are in agreement with all issues (uncontested) and have property but no children. Over 15 PDF fillable forms including all required forms and procedural forms. All forms are PDF format with fillable form fields and unlimited saving & editing. Step by step instructions for filing Pro Se (self-representing) . Helpful links and resources for Pro Se litigants. 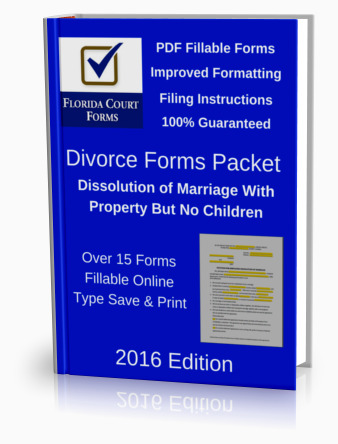 Looking for an easy way to fill out your uncontested divorce forms? Tired of searching and cobbling together bits and pieces of forms and info from all over the web AND looking for easy to follow step-by-step instructions and filing procedures? 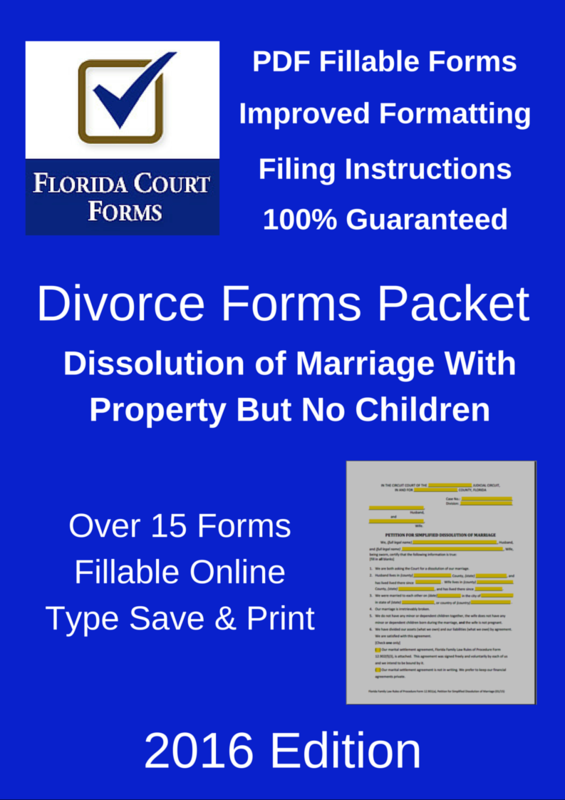 Our premium Florida divorce forms packet, DFP901b2, includes all the forms in PDF fillable format and step by step filing instructions for an uncontested divorce with property but no dependent or minor children. With our divorce forms packet, you'll have all the forms you need in fillable PDF format, and the do it yourself instructions to successfully file for an uncontested divorce with debts and/or assets but without children, guaranteed. So, What's Included in Our Premium Packet? Over 15 PDF fillable forms, required and procedural forms. Step by Step filing instructions. Tips and resources for self representing litigants. Our 100% money back guarantee. Included are instructions on which forms to fill out and step by step instructions on how and where to file and the typical process for a divorce available in every county. Our forms are guaranteed to be accepted by all Florida circuit courts, properly formatted, without errors, or your money back, no questions asked. And we will send you any form you may require that is not included (subject to availability).